Your home's sidings are one of your first defenses against harsh weather elements. Being constantly exposed to dirt, water, heat and wildlife or insects, sidings are prone to structural damage. However, we often overlook the condition of our homes' exterior materials until the damage is already irreversible. Knowing the usual suspects in siding problems would help you fix the root cause and prevent future damages. Here are top causes of siding issues and tips on how to solve them. If you live in an area with a lot of rainfall or if your home is exposed to fluctuating high and low temperatures, then moisture could be a source of siding problems. When moisture issues are neglected, your sidings could grow mildew and molds, which ruins your home's curb appeal. High levels of moisture also speed up the decay of wall and siding materials such as wood, which could lead to pest infestations and major structural problems. The fix: Visually inspect you sidings for algae or mold growth. 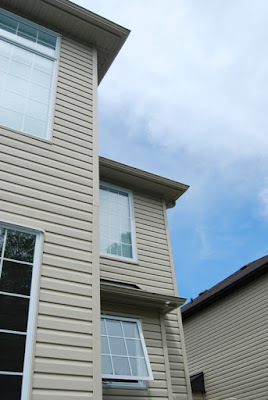 Clean them using mold and mildew removal mixtures but be careful not to damage the siding materials. Likewise, look for possible water leaks in the walls and the roof and have those patched up or repaired. If the siding is too damaged or rotten, replace that part with a new one. To prevent problems caused by moisture, install a waterproof barrier just underneath the sidings to keep moisture away. This happens when inexperienced homeowners try to install the sidings themselves or when they hire someone who is not competent enough to do the job properly. If your sidings and flashings are poorly installed, you would have moisture and leak issues, as well as warping and buckling problems. The fix: Have your sidings inspected by a trained and professional roofing expert from a reputable company. They should be able to fix tight sidings, properly fix flashings and install expansion joints. It is better to spend a few more bucks to hire a professional now than spend even more to repair damages in the future. Most siding materials do not require frequent maintenance; however, that does not mean you could just neglect your home's exterior. If you don't inspect and maintain your sidings every now and then, small problems like cracks, dents, holes, water leakage, mold growth, buckling, warping, or rust would be left unaddressed and could cause greater damages. The fix: Inspect sidings for any signs of damage, especially after experiencing extreme weather conditions or during seasonal changes that bring about fluctuations in temperature. Make sure you clean your sidings with a warm mixture of trisodium phosphate and water at least once a year.